Done in the mid-1960's when Williamson was working on the Flash Gordon comics for King Features. 7 X 9.5 inches. 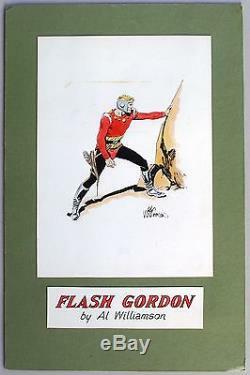 The item "FLASH GORDON Painting by EC Artist Al Williamson, 1960s" is in sale since Monday, November 23, 2015. This item is in the category "Collectibles\Comics\Original Comic Art\Paintings". The seller is "amazing-adventures" and is located in San Mateo, California. This item can be shipped to United States, United Kingdom, Denmark, Romania, Slovakia, Bulgaria, Czech republic, Finland, Hungary, Latvia, Lithuania, Malta, Estonia, Australia, Greece, Portugal, Cyprus, Slovenia, Japan, Sweden, South Korea, Indonesia, South africa, Thailand, Belgium, France, Hong Kong, Ireland, Netherlands, Poland, Spain, Italy, Germany, Austria, Israel, Mexico, New Zealand, Singapore, Norway, Saudi arabia, Ukraine, United arab emirates, Qatar, Kuwait, Bahrain, Croatia, Malaysia, Colombia, Panama, Jamaica, Canada.